White cake, raspberry filling, and powdered sugar icing. The ribs are made from white chocolate. It was a lot of work, but very fun. Joe Crawford blogged this at 4:54pm in 2005 in October. The 10th was a Monday. You are reading this 14 years later. Comment. There are 5 comments Tweet. Send email. It has hashtags→ halloween holiday photos . Slashfood had a timely post on corpse cakes. Your stepson is a lucky kid to have a cool guy like you around :). 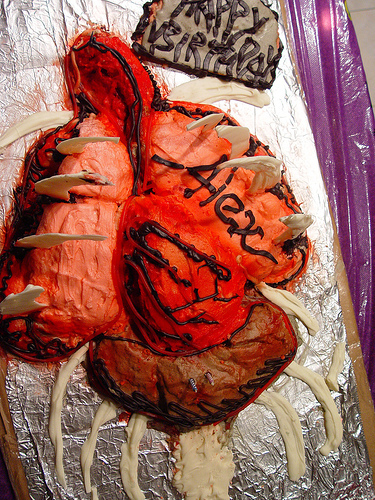 The cake I used as inspiration was this Thorax Cake. And actually, Alex is actually Alexandra; not a stepson, but a stepdaughter. Interesting cake! I like it! Btw, why guts? It was a Costume party with a Halloween Theme. There was even a small haunted house!